With its confident name, action-packed website and generous 100% deposit bonus, BetKing knows how to grab your attention. But does it live up to its royal title? A new site launched in 2018, the first thing you’ll notice about the audaciously titled BetKing is that this site is action-packed. It manages to walk a fine line between cluttered and exciting. The second thing you’re likely to notice is the promise of a rather tasty 100% deposit bonus to help entice you into joining. It certainly seems, on the face of it, that BetKing has a lot going for it. However, looks can be deceiving and we’ll have to delve deep before deciding whether BetKing is really worth signing up to. Does this site live up to its royal status? Or is a pauper in a tin crown? We’ll be looking at all the nooks and crannies of BetKing to give you the lowdown on whether this Nigerian bookmaker is worth your time and money. Unlike many competitors, the terms and conditions for the promotions on BetKing are fairly easy to find. It would admittedly be better if you didn’t have to look through a Help guide and if they were prominently displayed instead, but it only took us half a minute to find the information we needed. There are two key bonuses at the time of writing, so here’s a quick overview of what we think are the most important things you need to know. Do keep in mind though that this is not intended as a comprehensive reading of the terms and conditions and more information can be found on the website itself. 100% Deposit Bonus: Your deposit will be matched 100% up to NGN 100,000. In other words, if you deposit more than that amount, you will still only receive NGN 100,000. 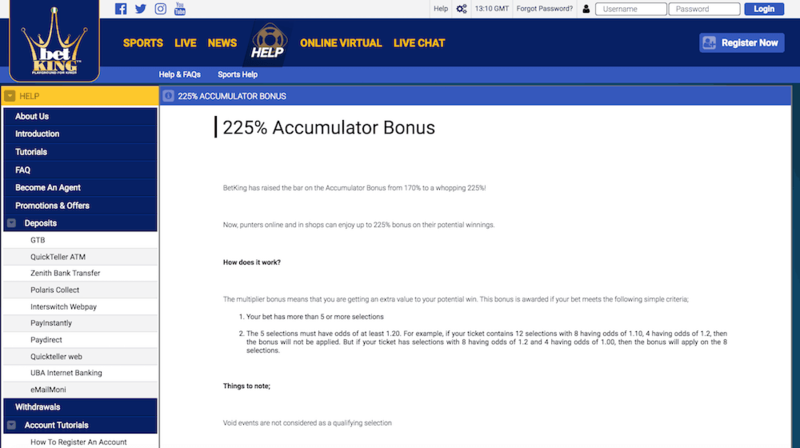 A percentage is added to your accumulator bet with a minimum of five selections. The more selections, the higher a percentage bonus you receive. For example, with five selections, you will receive a 5% bonus and with 40 selections, you will receive a 225% bonus. There is a table on the Help section displaying the exact percentage bonus you can receive per selection amount. While BetKing might not have the largest selection of bonuses in the world, it does at least make the ones it has count with reasonable terms and conditions. BetKing is a sports only site. That means you won’t find any casino games here, so if you’re looking for more of a jack-of-all-trades kind of betting site, you’ll need to look elsewhere. Unfortunately, with the exception of a few sports, we found the offering here to be very much lacking. While there’s plenty of sports selections, the events to bet on is actually quite small. Additionally, there is nothing here in the way of esports to spice things up. While the rest of the site can often feel overwhelmingly busy, the mobile version is actually a great exercise in minimalism. For many, this will not only be an acceptable version of the site but the preferable one. It’s simple, easy to use and logically designed. Plus, it shows – considering the lack of content the site has in many areas – just how easily you can strip all the extra fluff away and create an easier to use product. 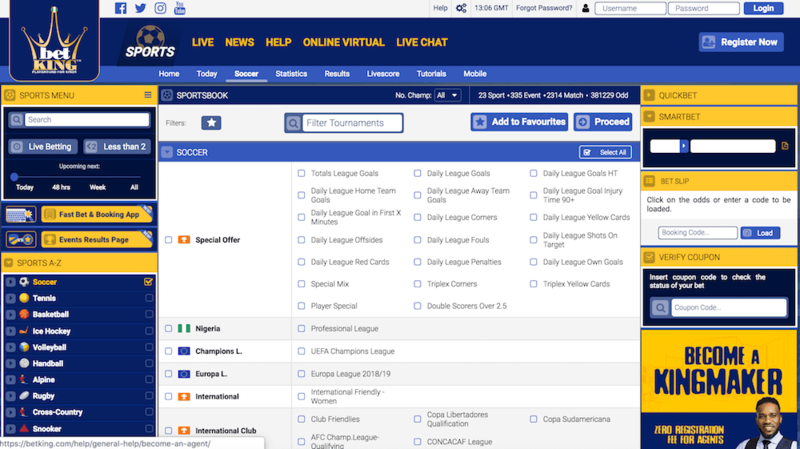 Live betting is also available here, with virtuals being the only thing that appears to be missing. While we can criticise the BetKing product in general, there’s little to complain about when it comes to the accuracy of its transfer to mobile. 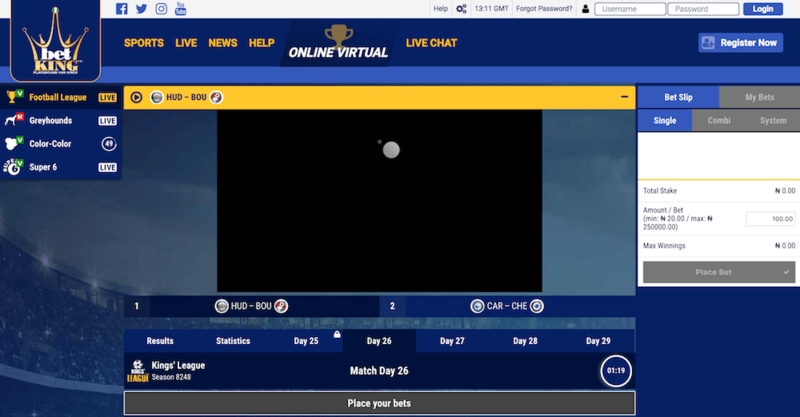 There is a virtual section available at BetKing. That being said though, we found this part of the site in particular to be a disappointment, with an offering too basic to compete with the much more technologically advanced offerings that allow people to get much more involved in the virtual games. There is limited live streaming via a small animation. However, once again, it’s about as bare bones as these things get. The best we can say here is that it’s better than nothing. 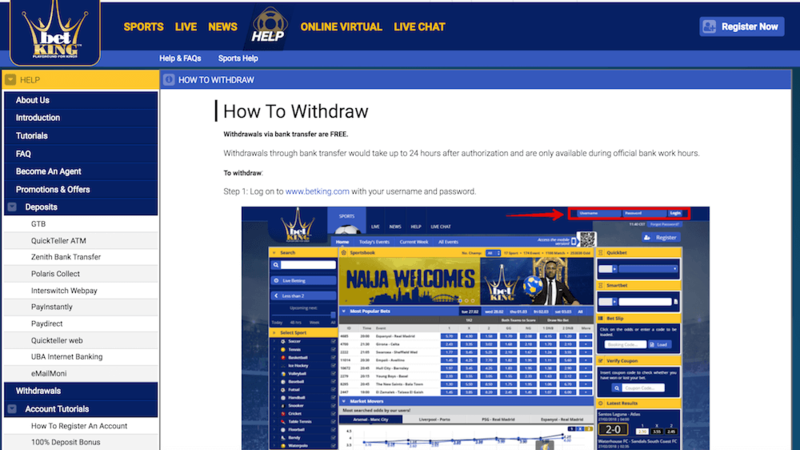 One area where BetKing does deserve praise is in how useful its Help section is when it comes to payment and withdrawal methods. Here, you can go into detail with all their deposit options, which include GTB, QuickTeller ATM, Zenith Bank Transfer, Polaris Collect, Interswitch Webpay, PayInstantly, Paydirect, Quickteller web, UBA Internet Banking and eMailMoni. Withdrawals are completed via bank transfer. Things like fees, as well as minimum and maximum deposits, are all available to view online, although deposits generally claim to be instant. Withdrawals, on the other hand, require 24 hours. The only acceptable identification includes a national ID card, Permanent voter’s card, Driver’s license and International passport. The timeframe in which you need to provide these documents is a rare instance of this site lacking information in this department. This is an interesting one because live chat appears to only be available on the mobile version of the site and not on the general desktop website. It’s another strange example of the mobile site actually outperforming its bigger brother. Regardless, there is a customer care line for those not on mobile, as well as a WhatsApp line, email and social media. One negative is their opening hours, which begin at 7 am and end at 9 pm. Obviously, total coverage is always preferable. But the main issue here is actually regarding customer feedback. 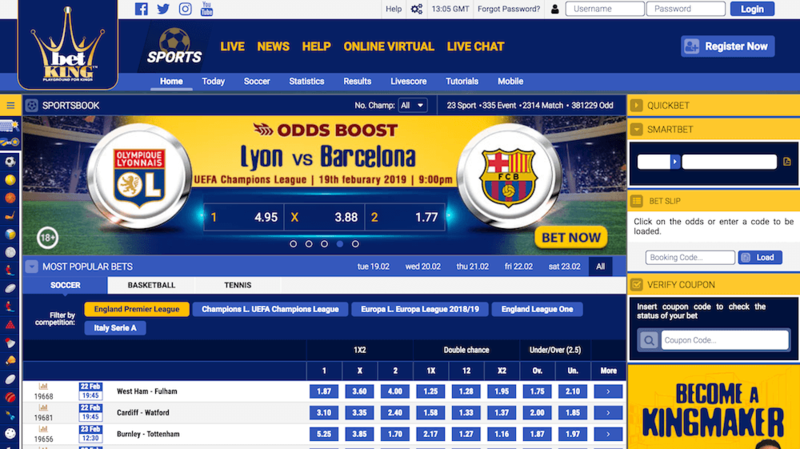 A key issue we have with BetKing is the site is so new that finding any kind of reliable responses from customers, at the time of writing, appears impossible. So, we can’t make a judgement on what the general customer reaction to the helpfulness of customer support is when they’ve needed it the most. The issues we’ve mentioned regarding a lack of feedback are even more present here. We can tell you that they state they are licensed by the Lagos State Lotteries Board, Anambra State Gaming Company and the Osun State Government, as well as the National Lotteries Board. However, we cannot make any judgement regarding if their customers feel they are reliable, nor much regarding encryption or the competitiveness of their odds. While we understand that BetKing can’t do much in terms of forcing customer feedback – that will come with time –, there should be more information on data protection and odds. There is a little information on responsible gaming, and you can ask customer service to activate deposit limits or to block your account, but a more automated limiting system would be preferred. There are a couple of very key issues with BetKing. One is that the site is extremely limited. Although a lot of the sports appear to be on offer, the majority of them are lacking in content. Not only that but their virtuals section is lacklustre, and there’s no casino to be found. The second issue is really a lack of customer feedback, meaning that there’s a limit to how much we can assess the quality of things like customer service and reliability. Really, it’s the customer experience that matters the most with these subjects. We can’t, for instance, tell you how they have coped in the past with issues relating to a customer account. They are new and that feedback will come eventually but for now, we’re left in the dark. Ultimately, the usefulness of this site is only for players who want a specific service related to some sports, and who don’t mind about content lacking elsewhere. As we’ve said though, BetKing is still in its infancy and hopefully, they have plans to expand their offering, and therefore their appeal, in time.